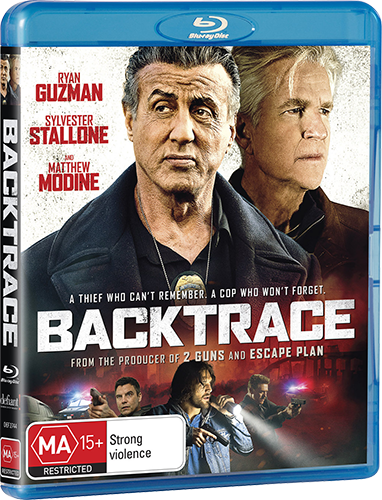 Starring Sylvester Stallone alongside Matthew Modine ('Full Metal Jacket', Netflix's 'Stranger Things') and Ryan Guzman ('Notorious', TV's 'Pretty Little Liars', and '9-1-1'), 'Backtrace' tells the story of a small-town heist that goes horribly wrong leaving only one survivor, MacDonald. But his injuries have left him with amnesia, and he can’t remember the crime or where he stashed the money. When a mysterious trio break him out of hospital, they inject him with an experimental serum to try to solve the million-dollar mystery. But a determined local detective and a long-forgotten enemy are on their trail and MacDonald’s fractured mind may not survive the drug’s dangerous side effects. The 'Backtrace' competition has now closed. Winners will be announced shortly. Competition opens at 5pm AEDT on Sunday 24th February 2019 and closes at 11:59pm AEDT on Sunday 3rd March 2019. Five winners will be chosen at random on Monday 4th March 2019. To successfully win, entrants must fulfil the above entry conditions before the time the competition closes. Current members/followers are eligible to enter the competition. Only one entry per person. Only one winner per household. To be a valid winner, the entrant must not have won a prize from SWITCH within the last 28 days. Each winner will receive one Blu-ray copy of 'Backtrace'. By entering, you agree to receive occasional emails from SWITCH in the future. If you decide to unsubscribe from these updates, any further entries will not be applicable. Only Australian residents are eligible to enter. 'Backtrace' is available on Blu-ray and DVD on Wednesday the 27th February 2019 from Defiant Screen Entertainment.